BCTF News Release, January 27, 2014– Marking the 12th anniversary of Bill 28, the unconstitutional legislation that stripped teachers’ collective agreements, BCTF President Jim Iker said the result is that a generation of students in BC have been short-changed. Iker explained that stripping teachers’ working conditions from collective agreements actually enabled the government to underfund education, which has led to the deterioration of students’ learning conditions. Due to the government’s illegal actions in 2002 and subsequent underfunding, BC has fallen behind the rest of Canada in support for public education. BC is last on seven key measures of education funding in Canada. BC is second worst in terms of per-student funding at $1,000 less than the national average. Only PEI is doing worse. BC has the country’s worst student-educator ratio. That means there are more students per educator than anywhere else in Canada. There are over 16,000 classes, 25% of BC’s total, with four or more children with special needs in them. That is a staggering 70% since 2006. It means all kids are getting less one-on-one time with their teachers. And, it means kids who need extra help aren’t getting it. 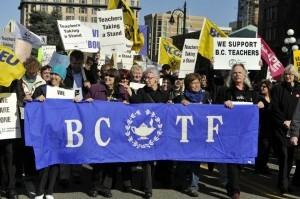 BC has lost 1,400 specialist teachers since 2002 even as the need for their services has gone up significantly. Close to 700 special education teachers, over 100 counsellors, and 300 teacher-librarians have all been cut from the system.